Nathan Cottom - "Face of the Company"
Nathan’s focus is on the training and support of Mango for end users. As the Operations Manager, his role is to ensure clients use Mango most efficiently and effectively to achieve their compliance goals. Prior to working at Mango, Nathan was the National Improvements Manager for a large international Label Manufacturing company. This gave Nathan extensive knowledge of quality, health and safety and environmental compliance. This means he has the ability to easily relate to clients and get an in-depth understanding of the QHSE challenges they face on a day-to-day basis. 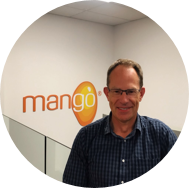 He knows Mango inside out and provides clients with advice on how they can improve their systems if necessary.